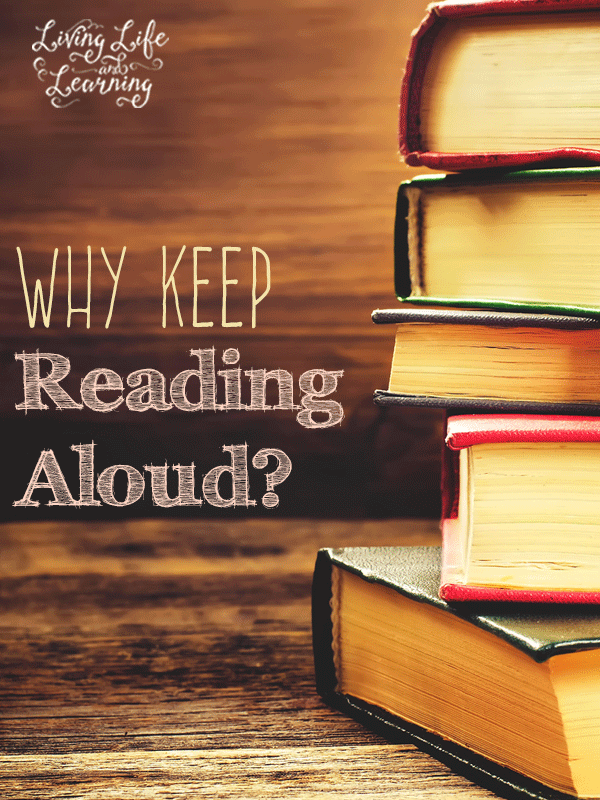 Why Keep Reading Aloud in the 5th Grade? Once your child gets older and perhaps other children are added to the family, you may start asking yourself why keep reading aloud? I mean you’ve spent all this time reading with them, they are reading well, do you need to keep reading aloud? My son, M1, is at the end of his 5th grade year and we still read aloud. We school year round so he will officially be in 6th grade in September. I just had to change our read aloud lists for this year, I had to delete half of the books off of my list for this year. I hate not finishing things that I set out for the year. I like that sense of accomplishment when you can say that you’ve finished a book by the end of the year. It feels great. Deleting those books off of my book list hurt, but I was replacing them with the Harry Potter books we’ve been reading. We’re now on Half Blood Prince. I love Harry Potter and I’ve been waiting until I was sure that he would be ready to read them. Now that we’ve started reading them, he can’t get enough. After we’ve read the book, we finish off by watching the movie. I do skim over some of the torture scenes, and won’t let him watch the scene in the Deathly Hallows with the lake of Inferi. Why do I keep reading aloud? Sharing a book is priceless. I know he could read the books on his own, but I love sharing the books with him. How else would you end up talking about witches and wizards. The boys were sick last week and we spent the whole week reading. I finished the 700 page book reading 3 hours a day with them. It was tiring but he just ate it up. He could have read it his own, or spent that time playing videos or anything else. But we spent that time huddle up together on the couch and there are only so many of these moments left before he moves out of the house. The discussions we have are something I would never give up. And it’s great to have something to share together to look back and reflect on as they grow up. I always wonder how he would do in school, if I wasn’t the one teaching him. I think it would be quite a challenge for him having to sit still for so long. I can pause to ask questions and check to see if he’s listening and understanding what I’ve read. We stop to discuss what he thinks will happen next. When issues come up we discuss what he would do if it was him or how he would resolve the problem. The point is that we are discussing and I hope that I’m imparting my way of how we’d like for him to handle new situations and problems and helping him think through problem solving as well. I’m so glad that at this time, we’re able to homeschool him and who knows how long we can continue. My son is a visual spatial learner (VSL), he doesn’t sit still, ever. He spent the whole time sitting by my side making all kinds of shooting noises, playing with his blocks or legos, or throwing or building something. I surely thought with the amount of noise he was making that he did not hear a word I had said. I was wrong. I stopped and asked him a couple times what was going on and he was able to tell me each time. He also asked a lot of questions. Had I asked him to read it himself and then write a book report about, I don’t think he would have enjoyed the books as much. You get to ask the questions and see what answers they come up with, you don’t miss any of those moments and when you read new books you’re able to reflect on those that you’ve already read together. My son loves telling me about the great book he’s reading but if I haven’t read it, it’s such a one sided conversation. If there are a lot of distractions in your house, read during little ones nap times or while you are nursing. Reading aloud can open so many doors for your children. It not only opens up great discussions but it’s is great quality time spent with your children. « How Can I Make Money from Home? Oh, reading aloud is so important! I grew up in a family that read aloud, no matter our age. (That’s because my mom did too. My grandfather always had a book going for his teens and up, and a different one for the littler ones.) When my aunts and uncles get together, they find a funny book to read aloud to each other. So of course I read aloud to my teens as well as my little ones, and it is the best part of our day. We do it after lunch, usually. Last year we filled our minds with a wonderful list of books, from Kon Tiki and some Arthur Ransome books, to L’Abri and Little Britches — and the mom in Little Britches read Shakespeare out loud to all the kids, who were not even teenagers yet! I completely agree. We read aloud through high school and tried to vary the topics so everyone was interested.